Beth Gibbons is notoriously enigmatic, cultivating a public persona as mysterious as Spy Noir tones of her band Portishead. She very rarely grants interviews – they make her feel “awkward” – even if the publication asking is the New York Times. So, when Times reporter Alex Marshall wanted to write a piece profiling Gibbons’ new take on Henryk Górecki’s Third Symphony, he had to get creative. “A news release,” Marshall writes, “said there were months of preparation for the 2014 concert where the recording was made. But how hard was it really for her to do this?” To answer this question, Marshall met with Polish National Opera director Anna Marchwinska – who intensively tutored the non-Polish-speaking Gibbons for her performance – and asked her to teach him to sing Górecki’s symphony. The ensuing article is charming and informative, and it provides an indirect look into the intimate process that went into recording this incredible symphonic work. Read it here. 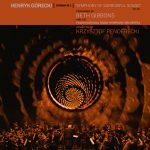 Górecki’s Third Symphony – sung by Beth Gibbons and performed by The Polish National Radio Symphony under direction of Krzysztof Penderecki – is available now on our download page.